Every woodworker seems to collect routers. For some reason we can never have too many routers. One style missing from my collection was a good d-handle router. With one of these edge routing should go much faster. The model the community wanted to see the most is the DW618D router. This model is part of the excellent DW618 series. It should perform very well, judging from the reviews it gets online. Let's take a look at how good the DW618D really is. In standard d-handle fashion the DW618D combines a plastic d-handle in the rear with a rubber knob at the front. A metal frame in the middle secures the router motor and holds it all together. The forward handle is installed at a ~20 degree angle relative the plane of the handle. This makes for better ergonomics when pushing the router. If you are left-handed or prefer to push the router with your left hand, the handle can be removed and reinstalled at the other side of the router. Overall the ergonomics of the DW618D are excellent. Everything about the router has been designed for pushing the router with both hands. 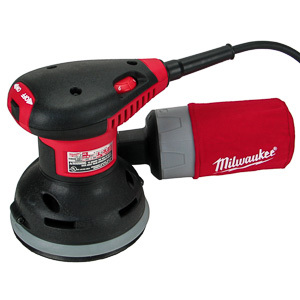 The d-handle adds a level of control that is hard come by in a traditional fixed base router. DeWalt included a clear plastic base with the router. When it's clean the base offers a clear view of the work piece below the router. It has groves for guide bushing installation, and cutouts for dust collection. Unfortunately the opening for the bit is only ~1 inch wide. A large-opening base is available, but it is not included in all kits. The DW618D does not come with this base plate, nor the centering tool necessary to install it. Keep this in mind when shopping for a DW618 router. Some kits may not include all the components you need. The base has attachment points for the DW6913 edge routing guide. 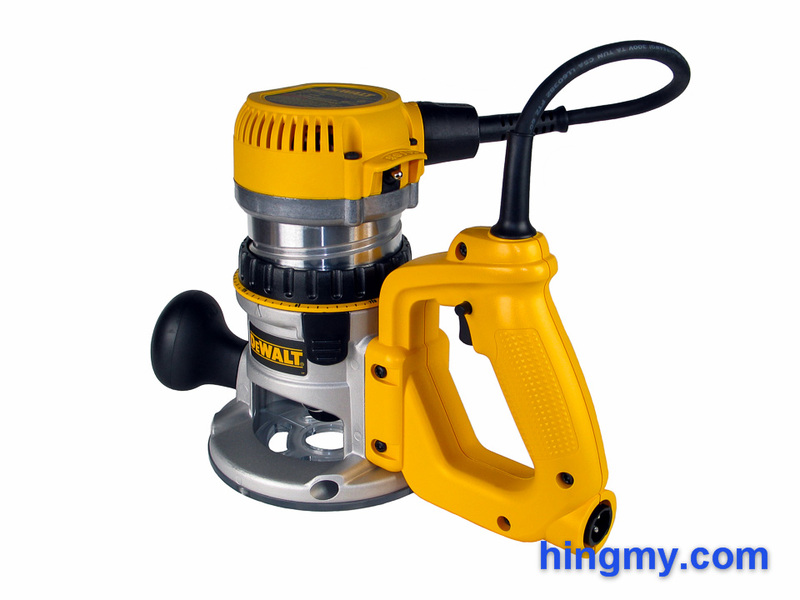 The guide can certainly be useful, but it is at odds with how a d-handle router is used. I don't want to tell you how to use your router, however. The option to install a guide is there, if you want to make use of it. Two spring-loaded clamps secure the motor in the base. All it takes to remove the motor is to disengage the two clamps and lift the motor right out. During installation a channel in the motor housing and a corresponding lock in the base ensure the motor is installed in the right orientation. The DW618D uses the DW618M variable speed motor unit. At 2 1/2 HP the medium size the motor is best suited for generic router tasks with small to medium sized bits. The motor can be removed and installed in a plunge base or fixed base. Both are sold as parts of other kits. Should the motor break it can be purchased separately. The best value, however, are the kit versions that include a motor and one or more base options. The DW618M can struggle with large cutters or long work session without interruption. Panel routing in particular pushes the DW618M to its limits. While it is capable of driving a panel bit, the feed rate suffers. 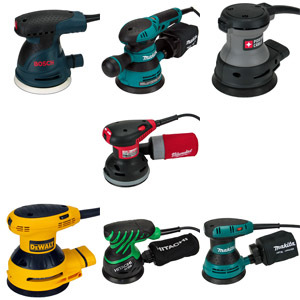 A hobby woodworker or small shop owner will not mind, but industrial users should take note. The duty cycle of the router is about 1/3 to 1/2 of every hour. If the router is used continuously, the motor will overheat until the the thermal shutdown protects it from a premature thermal death. Again this is perfectly suitable for a general purpose router, but should be clear statement for those of you who are looking for a production router. 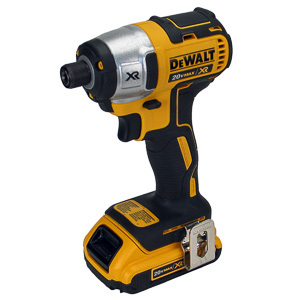 Unlike its little brother, the DW616M, the DW618M is a variable speed motor. A dial at the top of the motor housing controls the speed within the range of 8,000-24,000 rpm. The dial is infinitely variable and produces consistent and repeatable speed settings. The power cable of the DW618 motor is removable. The engineers added this feature specifically for the d-handle base. Routing the flow of power through the handle allowed the installation of trigger in the handle. 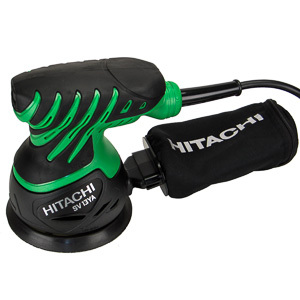 When used with the d-handle base, the power switch on the router is left in the ON position. The trigger in the handle takes over. The trigger is nothing more than a simple on/off switch with a lock-on bottom. There is a small, but noticeable delay between engaging the trigger and the router spinning up. This may be due to the motor's soft start feature. The spindle comes up to speed gradually to eliminate all rotational torque during the acceleration process. This feature works exceptionally well in practice. The router will not move at all when the power comes on. The power cable connects to the router base with a proprietary twist lock plug. The plug is keyed to ensure the proper connections are made. A twist ring locks the plug in place once it is seated fully. No amount of tugging on the cable will break the connection. Aligning the plug, twist ring, and socket can take some time; especially in low light. With some practice, however, the job gets done fast enough. The motor housing includes a spindle lock. The lock button is very easy to press and hold. Bit changes with the motor installed in base are not at all easy to complete. It is far easier to remove the motor entirely, turn it upside down, and replace the bit. The opening in the base is just too small to make bit changes an easy task. The depth adjustment mechanism is the centerpiece of the DW618 router system. A single ring combines both fine and coarse height adjustment in one. As the ring is turned the router moves up or down. One full rotation of the ring moves the router one inch. A scale built into the lower part of the ring show how far the router has moved. The scale has tick marks every 1/64", but reads accurately down to 1/256". The scale freely rotates around the ring to allow it to be zeroed out relative to a mark on the base. Measurements relative to any point are possible with an accuracy of 1/256". A clamp secures the router in the base. It must be loosened to make a height adjustment, and re -tightened for the cut. The clamping pressure can be configured with a lock nut. The review model needed some tweaking to get the pressure just right. If there is too much pressure the motor can move as it is locked down. Unfortunately the locking mechanism is not fool-proof. The clamp must be closed with care to avoid moving the motor. Since it cannot be trusted completely, the depth of the bit must be check again after the clamp is closed. All these features combine to make the DW618D's depth adjustment mechanism one of the best on the market. It simply does not get any easier than this. Best of all, the system is easy enough to understand without an instruction manual. You won't have to relearn your router on those rare occasion you actually use the scale. Simple things are the things that get used. Dust collection is easy to explain. There simply isn't any. 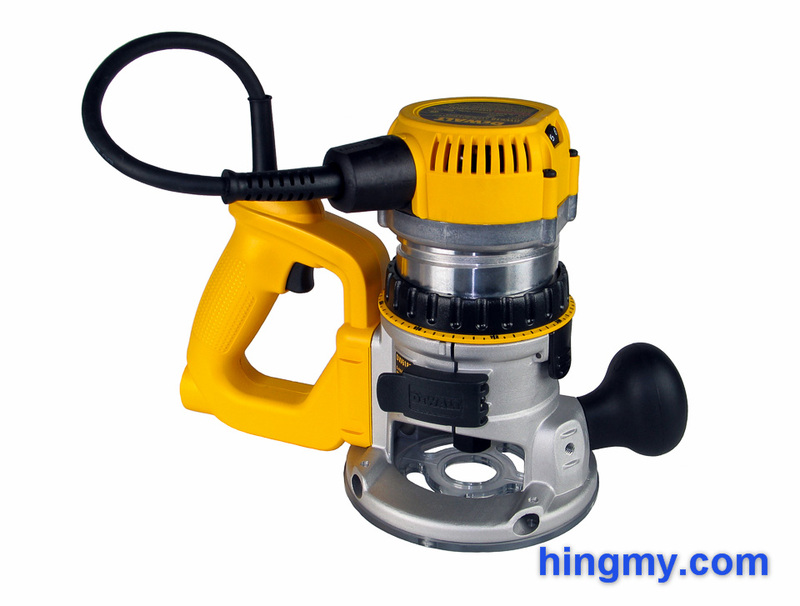 The DW618D has not place to attach a hose or a dust shroud. This design decision seems to be a bit behind the times, but it is fairly common for d-handle routers. Only the Porter-Cable 891 offers built-in dust collection. If you absolutely must have dust collection, the only way to add it to the DW618D is the optional edge guide. The guide has a built-in vacuum port along with a dust shroud that encloses the bit below the base plate. This setup can't be used for all cuts the DW618D is capable of, but it'll collect the majority of dust when it is. Within the limits of a mid-sized router the DW618D performs very well. Setup times are low thanks to the impressive depth adjustment ring. Once the bit is aligned things get even better. The soft start motor spins the bit up to speed without any vibrations. The user can position the router perfectly and concentrate on the work rather than keeping the tool at bay. Ergonomics during the cut are at a level that only a d-handle setup can provide. For edge routing there simply isn't a better feel available. If you have never used a d-handle router, you owe it to yourself to check one out at a local store. You'll know what I am talking about the second you put your hands on the handles. The motor power of the DW618M is well documented. 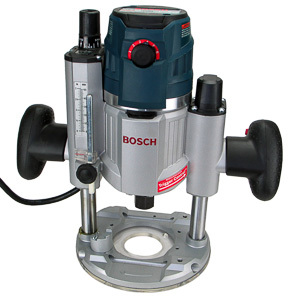 It has no problems spinning a mid sized cutter head through just about any domestic or exotic hardwood. Panel cutters and long routing session can bring it to its knees, but it takes some pretty extreme scenarios to get there. The variable speed feature is a welcome addition. Being able to match the speed of the router to the cutter bit and wood species by itself makes routing easier. With the corrected settings the bit will leave behind a cleaner edge that requires less sanding. The lack of a dust collection system is clear drawback. It's hard to ignore the mess the DW618D leaves behind. 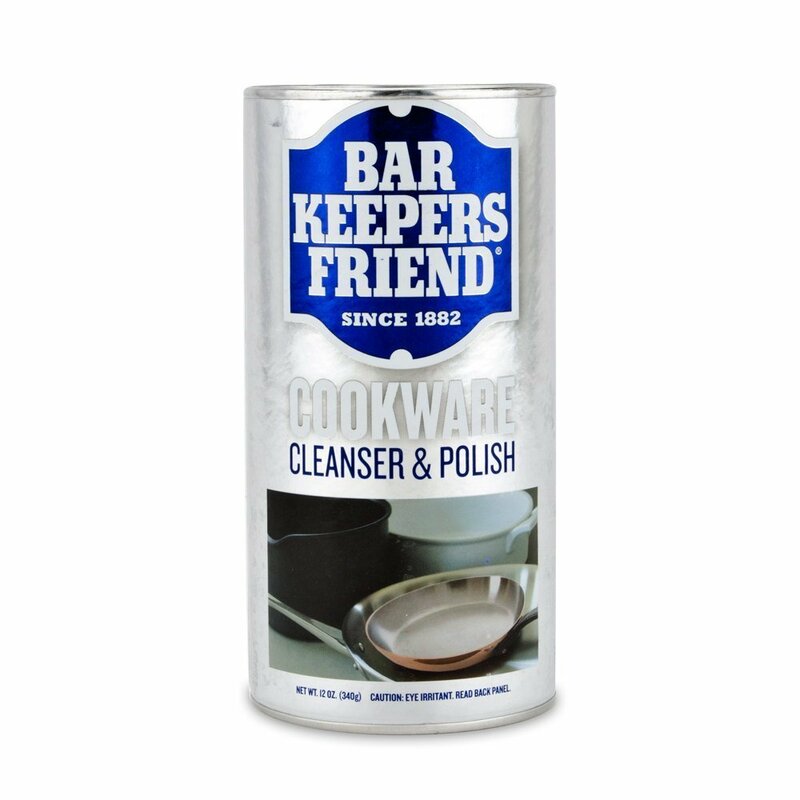 If you don't use dust collection regularly, you won't mind. With the DW618 router series DeWalt has created on the most complete router system available today. A single motor fits into a fixed base, plunge base, and d-handle base. It is an economical way to own all three router types. Off course there are trade-offs to be made. The DW618 series can't do it all. The performance of the motor firmly puts the series in the mid-size router segment. There is still place for larger, more powerful routers. 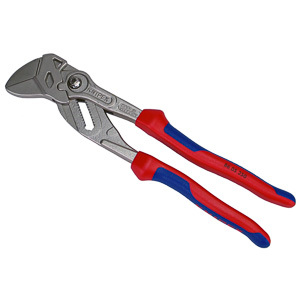 The DW618 series is an excellent tradeoff that most often is the best for the job at hand. 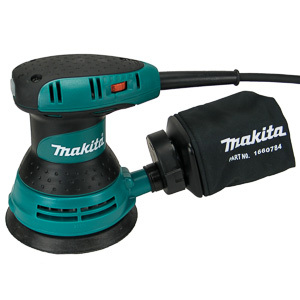 The d-handle router market is a small one. There are only a few models to chose from. The DW618D has the distinction being the only d-handle router that can be can be converted to the other two base types. The design of all d-handle routers mirror each other very closely. There is only one router, the Porter-Cable 891, that dares the deviate from the mold. 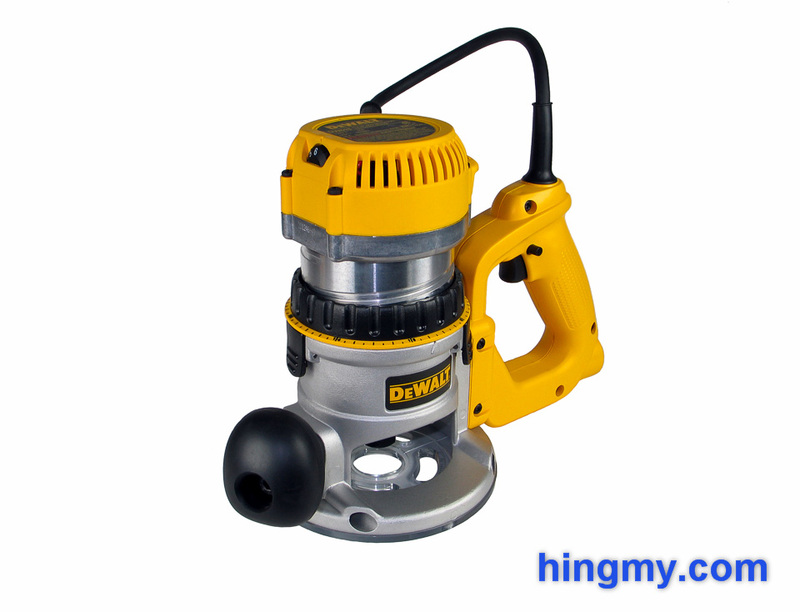 The DW618D is an excellent router that makes the exotic d-handle form factor a little more affordable. With a variable speed motor, a super simple depth adjustment mechanism, and excellent ergonomics the DW618D is pleasure to use. It's mid-size motor cannot do it all, but it is powerful enough to complete most tasks around the shop very well. The router has no dust collection whatsoever in it's base configuration. To really function as a all-around router a few accessories are needed that are not included in the DW618D kit. The best value in d-handle router kits may not be the DW618D itself, but the larger DW618B3 kit that includes the other two bases. The DW618D is part of an excellent mid size router system. If you can look past the missing dust collection, this router will be in your shop for a very long time. Few mid size routers are an upgrade to this one.